Yesterday I came across an obituary for my grandmother’s half-sister’s husband. For those not engrossed in genealogy and the quest for information about their ancestors, that may seem like an obscure find not worth investigating. I am going to use it as an example of how each piece of information is worth exploring for further hints. I have formatted the obituary in italics with my research notes interspersed throughout. The newspaper citation itself tells me that my some of my ancestors had connections to Checotah, Oklahoma. W.B. Beck pioneer citizen of McIntosh County answers final summons Monday. Following a long illness of only a few days duration, death claimed the life of W.B. Beck at his community home East of Checotah Monday afternoon. The news of his death was a great shock, to the majority of our citizens as he appeared in good health the last time he was in the city about two weeks ago. Mr. Beck was one of the best known citizens of McIntosh and was indeed a pioneer in point of residence having located here in 1969. He was a lifelong Democrat and always took an active part in party affairs and held the honor of being McIntosh County’s first representative in Oklahoma legislature. He was a man who was a friend to his neighbors, never forgot a friend nor betrayed a trust. I will be traveling from Fort Smith to Warner Oklahoma later this month. McIntosh County is just west of Warner. I now know that a stop in McIntosh County and a visit to the museum and court house there may provide some information and possibly photos about some of my ancestors. William Billingsley Beck was born at Corinth Miss. January 26, 1847 and his early life was spent in that state. With his parents he moved to Texas in 1860 where he resided until the beginning of the Civil War. He enlisted in the cause of the Confederate Army and served until the close of the war. Next is the first piece of information that mentions a blood relative, Malinda J. Crittenden, my grandmother’s half-sister. Malinda’s father is my great grandfather, Moses Crittenden. On September 6, 1866, he was united in marriage to Miss Malinda J. Crittenden at Dallas, Ark. He was married under the Cherokee law prior to 1875 thereby sharing the full citizenship with the Cherokee by blood and was the first white male to serve in the Cherokee Council, beinq elected to the body in 1898. I did not know that my great Aunt Malinda was married in Dallas, Arkansas. A search on the internet provides a map showing Dallas as just south of Mena, Arkansas. On my genealogy trip later this month I am spending two days in Mena, Arkansas. My great grandfather Moses was granted a land patent in that area in 1860. While there I plan to go to see that land. I also plan to spend some time at the Polk County Court House in Mena researching what happened to the land when Moses left for Oklahoma. I am hoping the local museum will have photos from that time period and may provide me with some context for what life was like for the first Cherokee families to arrive in Arkansas. This information about the marriage of my great aunt in Dallas, Arkansas provides more facts on which to base my research. In 1868 he located near the present site of Westville, where he resided for nearly a year, when he moved to this county, which has been home. The first week of my trip will be spent in Tahlequah, the Cherokee Nation Capital. Westville is a short drive from Tahlequah. I will search the museum in Westvilee for photos of my great Aunt Matilda or other members of her family. Besides the wife, deceased leaves one daughter, Mrs. Eliza Caughran, and two sons, Tom and Carol to mourn his loss. He is also survived by 15 grandchildren and 16 great grandchildren. This is the most important piece of information for me. 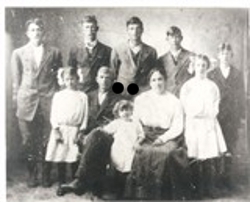 A search for Eliza Beck Caughran at Ancestry.com provided me with a photo of her family. I also now know that there are grandchildren and great grandchildren, and probably great great grandchildren, some of whom are most likely still living. Someone posted the photos of Eliza Beck and of her family. I can now search for current records that might lead me to identifying those living relatives. My hope is that someone in the family has photos of my great grandfather Moses Crittenden and other relatives. They may also know family stories passed down about the family’s early days in Arkansas and Oklahoma. During his early manhood, Mr. Beck united with the Methodist church. He was also a member of the Checotah Lodge, I.O.O.F., and several other organizations. The Methodist Church and the Checotah Lodge are two more places where I might find some historical records related to my family. Funeral services were held Tuesday afternoon at Twin Grove Cemetery, in charge was Rev. E.A. Davis, pastor f the Methodist church” assisted by Rev. E.A. Spiller pastor of the Baptist church. The beautiful Masonic service was held at the Grove in charge of the local lodge. Internment occurred at the Twin Grove Cemetery East of Checotah. I have added Twin Grove Cemetery to my list of cemeteries to visit on my trip. Every piece of information that you discover, no matter how minor it may appear, is like a mine waiting to be searched for those gems that will illuminate details about your ancestors just waiting to be discovered. My Cherokee roots pass down from my grandmother, Eliza Jane Crittenden West. My grandmother did not share her family history or her childhood with us. As I research her life and the history of the times, I have a better understanding of why she found it hard to discuss. I decided in the 1990s, many years after my grandmother had passed away, that I would trace my grandmother’s roots and the story of her and her family. While visiting Cherokee, North Carolina during that period I purchased a book, “Cherokee Roots, Volume 2: Western Cherokee Rolls” by Bob Blankenship, that listed my grandmother’s Dawes number and a Dawes number for my mother’s eldest brother James West. This was before the days of digital files on the internet. I wrote to a few places trying to find more information about my grandmother and the Dawes Rolls and did not receive any responses. In 2009 I made a promise to myself that I would finally commit to doing the research needed to learn more about my grandmother and her family. Although there was not as much information online as there is now, there were many more resources available than in the 1990s. My first search for information led me to the web site for the Museum of the Cherokee Indian in Cherokee, North Carolina, where I had found my one piece of information many years before. Based on recommendations in their genealogy section I purchased a book from their online book store, “History of the Cherokee Indians” by Emmet Starr. Emmet Starr’s book has a section titled, Old Families and Their Genealogy. In that section I found many Crittendens listed as descendants of the Downing family. 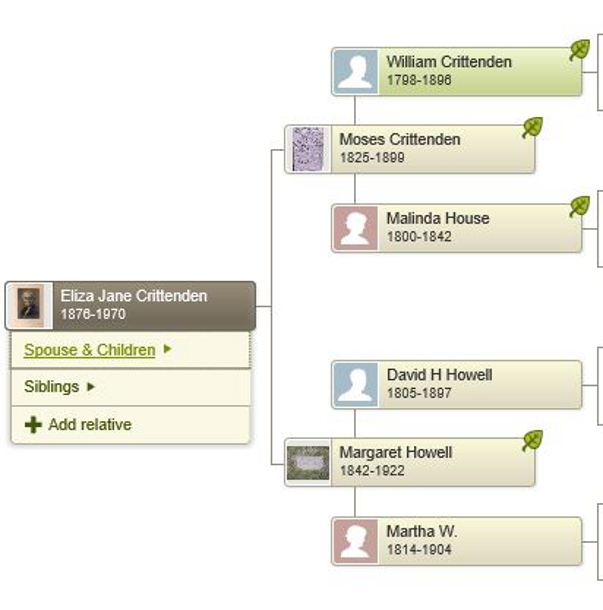 Once I determined that my great grandfather was Moses Crittenden, this genealogy section allowed me to trace his lineage back to Major Downing. I then started looking for more information on Moses Crittenden in my original book, “Cherokee Roots, Volume 2: Western Cherokee Rolls”. In addition to listing the names on the Dawes Rolls, the book includes the 1851 Old Settler Roll, 1852 Drennen Roll and the 1909 Guion Miller West Roll. I found my great grandfather and his family listed in the 1851 Old Settler Roll. This gave me the first bit of information about my family’s migration from North Carolina. This roll lists the names of Cherokees who were already residing in Oklahoma when the main body of the Cherokees arrived in the winter of 1839 as a result of the 1835 Treaty of New Echota. So now I knew that my Crittenden ancestors migrated some time before 1839. These pieces of information were the first roots for building my Ancestry family tree.